Chinese translation (simplified Chinese) published in 2018 by Communication University of China Press (ISBN 978-7-5657-2003-1). Chinese translation (traditional Chinese) published in 2017 by Wunan Book. 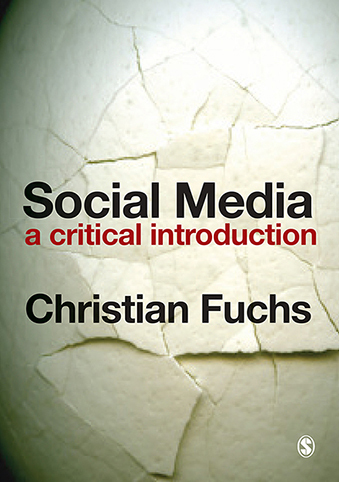 Audio of Christian Fuchs’ introduction to the Book Colloquium that focused on “Social Media: A Critical Introduction” at the Univ. of Oxford on October 9, 2014. Information, communication, collaboration and community are forms of sociality. But what is now social about Facebook? You want me to read Karl Marx? Are you nuts? Why the hell should I do that? So, you tell me that Marx invented the Internet? How can one define critical theory? The Frankfurt School – Not a Sausage, but a Critical Theory! Critical Political Economy and the Frankfurt School are two Critical Theories. But do we really need two of them? How New are Social Media? Is Online Fascism Participatory Culture? Social Media and Fans, Fans, Fans – Did Occupy, the Arab Spring and WikiLeaks Never Happen? Castells: Social Theorist of the Internet in the Information Society? Castells on Power: An Essential Feature of All Societies? Jeffrey Juris, Paolo Gerbaudo and Miriyam Aouragh: For or against Castells? Work at Google: Fun and Good Food? Diaspora*: An Alternative to Facebook? The 2011 Protests and Revolutions: Twitter and Facebook Revolutions? Congratulations to you for this new book . Pingback from Social Media. A Critical Introduction. | Mon carnet uquterrestre pour les cyc. sup.